The first closed-loop system for distilling commercial quantities of ethanol using methane gas recaptured from cow manure is set to begin production next month in Mead, Nebraska. The plant's technology will virtually eliminate the need for fossil fuels in the production of ethanol. 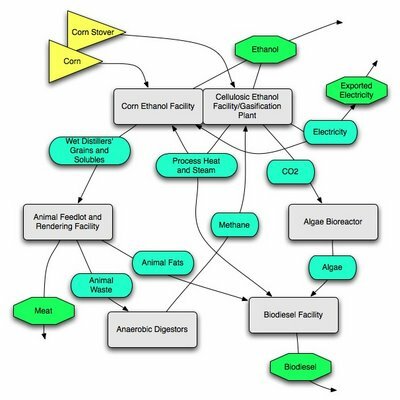 The 'closed-loop' system - derived from an exclusive patent co-owned by an affiliate of E3 BioFuels - combines a 25-million-gallon per year ethanol refinery, beef cattle feedlot and anaerobic digesters to maximize energy efficiencies unavailable to each component on a stand-alone basis. This system eliminates the potential for manure to pollute watersheds, and it enables the wet distiller's grain from ethanol production to be fed on-site to cattle without energy-intensive drying and transportation costs. In the October edition of Wired Magazine, venture capitalist Vinod Khosla wrote, "It may surprise you to learn that the most promising solution to our nation's energy crisis begins in the bowels of a waste trough, under the slotted concrete floor of a giant pen that holds 28,000 ... beef cattle." Khosla, co-founder of Sun Microsystems, continues, "E3 BioFuels is about to fire up the most energy efficient corn ethanol facility in the country: a $75 million state-of-the-art biorefinery ... The output: a potential gusher of renewable, energy-efficient transportation fuel." "The Genesis plant at Mead will be the first to market ethanol produced from closed-loop, self-sustaining ethanol technology by at least a year or two, in comparison to any other competitors," said Dennis Langley, Chairman and CEO of E3 BioFuels. "This plant will make ethanol more than twice as energy-efficient as any other method of producing ethanol or gasoline." E3 BioFuels-Mead has named the plant Genesis to celebrate that it's the first commercially viable facility on the planet to use this new technology - which officially begins production in December 2006 - as well as signifying the birth of a revolution in energy production. "This is the new low-cost alternative for meeting America's energy needs with domestically produced ethanol," Langley said. "E3 BioFuels' system enables America to take a giant leap from the oilfields of the Mideast to the cornfields of the Midwest. The future is now, the future is here -- with the opening of the E3 BioFuels-Mead's Genesis plant." "The Genesis plant effectively serves as a diligent steward of the environment -- producing a clean-burning motor fuel, solving water run-off pollution from agricultural wastes, and reducing greenhouse gas emissions," added Langley. Langley said E3 BioFuels plans to build 15 more such plants near feedlots and dairy farms, of increasing size, within the next five years. For more on E3's plant, check out Robert Rapier's excellent posts on E3 over at R-Squared blog: here and here. I agree wholeheartedly that this kind of 'integrated' approach to bioenergy facilities is exactly what we need to see (here's another example of this kind of integrated biorefinery). This particular configuration may not be the most sustainable, but it's far better than conventional ethanol plants, and the kind of thinking involved in planning a facility like this is exactly the kind that designers of industrial facilities should be doing. Industrial facilities should be planned, whenever possible, like a sort of industrial ecosystem, where each part of the facility can utilize some or all of the waste-stream (be it solid waste, used water, co-products, waste heat or steam, even carbon dioxide, etc.) from the other parts of the facility. In this way, a number of loops are closed, or at least a number of outputs are recycled into useful inputs instead of heading straight to landfills, toxic waste dumps, wastewater facilties, or our rivers, oceans and atmosphere. Bioenergy facilities in particular can benefit from this kind of 'industrial ecosystem' design as they often have a number of different outputs, co-products and inputs that can work well together. One proposal I've advocated for before is an integrated bioenergy facility that produced both corn and cellulose-based ethanol. The facility would accept corn and corn-stover as inputs. The corn-stover would feed a gasification-based cellulosic ethanol process (like the one BRI is developing) which would produce both ethanol and quite a bit of waste heat. Some or all of the waste heat could then go towards process heat/steam for the corn ethanol side of the facility (with the remainder generating electricity for internal use and maybe some for export if there's any left). This would eliminate the need for coal or natural gas to run the corn ethanol facility. The distillers' grains and solubles and other co-products produced by the ethanol process could also be fed into the cellulosic ethanol process and gasified if that was more economical than selling the co-products. Further expanding on this idea, based on E3's model, the facility could also incorporate an animal feed operation, using the wet distiller's grains and corn meal produced by the corn ethanol process. The manure from the animal feed operation could provide further process heat/steam/electricity for the ethanol facilities. Burning the methane and gasifying the corn stover (and/or other cellulosic feedstocks) also produce a CO2 waste stream (although both processes are net carbon neutral, in the case of the gasification, or negative, in the case of the methane). This CO2 could be fed to algae bioreactors like the ones being developed by GreenFuels Tech. Corp. The algae can be used as either animal feed, or to make biodiesel in a co-located biodiesel facility. The wastewater from the algae process can be used to make process steam. So, in this facility, you take corn and corn-stover, plus animals as inputs and end up with ethanol, meat, corn co-products, biodiesel (perhaps) and maybe some electricity [the flow diagram would look something like the tangled rats nest below]. The facility would have limited emissions, be carbon neutral or negative, should limit water use (relative to non-integrated facilities) and minimizes waste streams. Obviously, I'm not sure quite how the mass/energy flows would break down (you might need some more inputs, like animal feed for the animal feedlot, and there are waste streams I haven't captured here), but I think a facility like this would be possible. Expense is also clearly an issue, although I would imagine that co-locating these facilities would limit capital expenses relative to the same facilities that weren't co-located, and thus offer a competitive advantage. Still it's going to probably be more spendy than a non-integrated ethanol facility using coal for energy. Operating costs should be lower though as the integrated facility makes good use of several materials streams that what would otherwise simply be waste. Whatever the final product looks like, the kind of integrated 'industrial ecosystem' thinking applied by E3 Biofuels to their new ethanol facility is an excellent model of the kind of thinking that should be applied across the industrial sector. Significant energy, materials, and cost savings can be realized while reducing waste streams, pollution and greenhouse gas emissions. recently I've been thinking a lot about net energy and efficiency again. Net energy is a great concept when you've got a process that has something (say Diesel) as its sole input and output and we want to know whether there's any net output, and how large it is. This breaks down when we are talking a conversion of one form of energy into another (say natural gas to space heat in a building). coal fired power plants (sole input coal, sole output electricity). It's when there are multiple different inputs and outputs when things get confused. What do you compare a CHP unit to? How about an ethanol plant? Should that be compared to a natural gas to liquids facility? Or an oil refinery? And what do comparisons of that sort based on a single efficiency or net energy number actually tell us? This has gotten me to think a bit more about a case where a simple efficiency metric does apply. Let's assume for the sake of argument that we want to produce liquid fuels from biomass, and if only to power plug-ins or necessary air travel, and that we want to convert ligno-cellulosic biomass, because at present that's got high yields for low agronomic inputs. a valid question is how can we best convert that into liquid fuels. what is the best technology we've got for that plant at the moment and what are the key hurdles? As far as I can see, the key advantage of the biological route is the huge conversion efficiency of sugar to ethanol. Bacteria can be fed 100 kWh of sugar, and convert that to greater than 97 kWh of ethanol, and live on the less than 3 kWh they extract in the process. and that the product ethanol is in dilute solution, with separation of the ethanol by distillation requiring a lot of process energy. But, how serious are these hurdles? How difficult are they to overcome? How much can research help? If enzymatic hydrolysis and molar sieves live up to their promise, it seems to me, that well over 90% of the cellulose and hemi-cellulose energy should be convertible to ethanol (ie some process energy will still be required, either from burning part of the cellulose or from burning part of the lignin). For gasification followed by Fischer-Tropsch, efficiency of 40% is claimed, maybe 50% if some of the output is not liquid fuels but rather electricity and process heat. But what are the hurdles there? If that was really the limit, a biorefinery processing the cellulose and hemicellulose to ethanol, and the lignin to Fischer-Tropsch liquid and just enough electricity and process heat to power the refinery without external inputs might be the most efficienct solution. You know in principle, a catalyst(s) that convert(s) lignocellulosic biomass at room temperature into kerosene at near 100% efficiency could be found. So why can't we get close in the case of Fischer-Tropsch or gasification? There'll be a host of practical difficulties, but can they be circumvented/overcome, and if so, how fundamental is the challenge? and nor do I think do the people deciding on what should get research funding.